I have some shocking news for you. Before I get to it, if you are NOT an investing nerd like me, then you are welcome to skip today's letter... No hard feelings. To give you some context, the CAPE ratio is a widely quoted measure of stock market value. It is the "cyclically adjusted price-to-earnings ratio." It was designed by Dr. Robert Shiller to give us a long-term look at stock valuations. 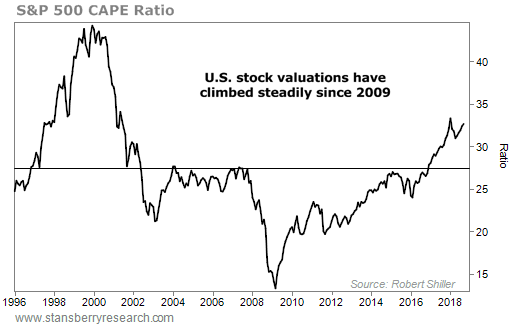 Stocks are actually trading at below-average valuations based on the CAPE ratio, when you look at earnings estimates going forward. But it's big news for us investing nerds. It will cause the minds of many academics in finance to blow a gasket. The point of the CAPE ratio is to attempt to smooth out distortions caused by the business cycle. So it looks at 10 years of stock prices and earnings (along with inflation) – not just one year, for example. It bottomed in March of 2009 – which is exactly when the stock market bottomed. The dot-com peak is obvious. And so is the 2009 bottom. One other obvious thing is the trend of the CAPE ratio today. It's going higher – fast. When investing nerds (like me) see it heading toward those dot-com highs again, most of them get very worried. Then, they draw a big conclusion... They say, "Crisis is imminent! The CAPE ratio says so." If that happens, the CAPE ratio will be below its long-term average value going back to 1996. However, a couple things are about to happen to the CAPE ratio between now and the end of 2019 that nobody is talking about at all. Analysts estimate that the earnings number used in the CAPE ratio will skyrocket to a level of 163.1 at the end of 2019, versus the current number of 122.5. Bad earnings numbers from the Great Recession of 10 years ago, in 2008-2009, are about to fall out of the denominator of the CAPE ratio, pushing the denominator higher. That means the overall CAPE ratio will be lower, even with no change in stock prices. That's right... Higher earnings estimates are just part of it. The "secret helper" that will drive the CAPE down later in 2019 is simply the calendar. For example, earnings numbers of around 8 or so in early to mid-2009 will be replaced with earnings numbers like 153.9 in June 2019 (based on analyst estimates). That is, obviously, a massive difference. 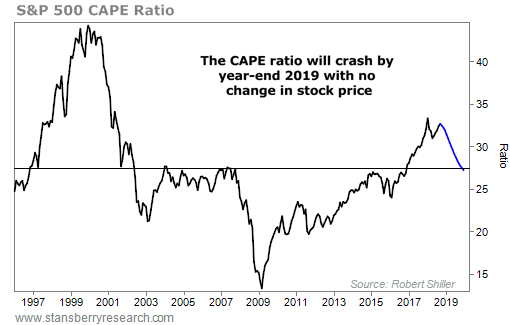 Between soaring earnings and the "calendar secret," the CAPE ratio is set to fall dramatically by the end of 2019... Far enough that could actually fall below its long-term average since 1996. No change in stock prices. Inflation of 2.3% at year-end 2019 (the consensus analyst estimate). Earnings that reach 163.1 at the end of 2019. The CAPE ratio falls – dramatically – even assuming no change in stock prices. And even if stock prices rise dramatically from here (as I expect they will during the "Melt Up"), these changes mean valuations will not start skyrocketing anytime in the near future. That's the really important part... You see, stock prices don't actually have to fall soon at all. Stock market valuation is only a symptom at a top – it's not a cause of the end of a bull market. And in any case, these estimates show stocks are not expensive today. I'm still sure 100 out of 100 academics will have a problem with what I've said here... They have already decided that stocks are expensive because of the CAPE ratio... and therefore, stock prices must fall starting very soon. And there's no changing their minds... at least for now. Valuations look artificially high to some folks right now. That's all going to change when these earnings changes kick in. So, fellow investing nerds, what does this actually mean for you and your money? P.S. On Wednesday, October 24, I'll reveal a lot more about the Melt Up at our big broadcast event. It's free to tune in... And I believe it's a must-see for anyone reading today's DailyWealth essay. Not only will I share a major prediction on-air, but I'm even giving away a stock recommendation that could soar 1,000% in the months ahead... Click here to save your seat. "If you were smart enough to know that valuations alone don't kill bull markets... you would have made an absolute fortune," Steve says. He learned this the hard way during the last big Melt Up... Read more here: Don't Be the Fool Today That I Was Back Then. "As a data-driven investor, I always look back at history to get of sense of what's going to happen next," Dr. David Eifrig writes. "And looking back, history suggests that we haven't hit a top yet." Find out why the biggest gains are still to come right here. 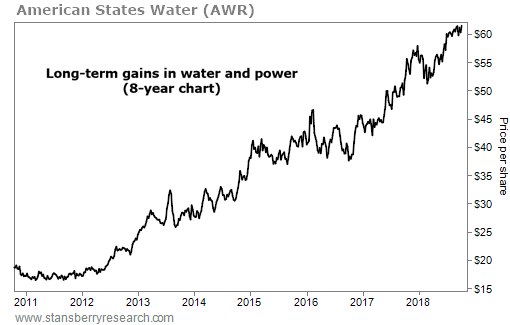 We can see this at work today with shares of American States Water (AWR). The $2 billion company provides water service to roughly 260,000 California residents, and electricity to 24,000 customers. American States also holds private contracts with the federal government, managing water and wastewater systems on military bases. This business pays off for investors… The company has increased its dividend payments every year for six decades. And it just raised its third-quarter dividend by 7.8% in July.